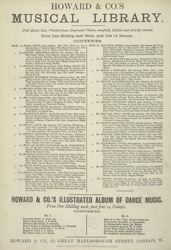 Music Hall songs tended to be about famous landmarks and attractions so that audiences would recognise them, as this enhanced their note of realism. This song sung by J L Toole, is about Madame Tussaud's the famous waxwork museum in London. Madame Tussaud's was popular with the Victorians as it provided them with a focal point for their fascination with the monarchy. Figures such as Queen Victoria were popular. It also provided a historical context, with figures of Napoleon and a history of the wars, also providing entertainment for those visiting the gruesome chamber of horrors.